Overnight, China surprised the market with its first trade deficit in more than a year amid escalating trade frictions with the United States, however there may be less than meets the eye here, at least for now. China's state customs announced that in March export growth unexpectedly dropped -2.7% Y/Y, far below the consensus estimate of an increase of 11.8%. Looking at the details, for exports to major destinations, exports growth dropped broadly. Specifically, for major DMs, exports to EU, US and Japan decelerated -7.0% yoy, -5.6% yoy and -3.7% yoy, respectively. For major EMs, exports to ASEAN grew by 1.4% yoy from a strong increase of 36.2% yoy in February. At the same time, import growth rebounded 14.4% Y/Y, more in line with expectations of a 12.0% rebound, although in Yuan terms imports rose a slower-than-expected 5.9%, missing expectations for 7.5%. For commodity imports, growth went down both in volume and value terms broadly. Specifically, in volume terms, iron ore imports contracted 10.2% yoy, vs. +0.9% yoy in February; crude oil imports grew 0.6% yoy, vs. +1.5% yoy in February; steel products imports decreased by 5.1% yoy, vs. -5.8% yoy in February. In value terms, iron ore imports continued to contract by -19.3% yoy, vs. -5.4% yoy in February; crude oil imports grew 19.1% yoy, vs. +26.4% yoy in February; steel products imports increased by 11.3% yoy, vs. +11.5% yoy in February. Of note, the country imported 5.66 million tons soybeans in March, down 11 per cent yoy and a 18% plunge compared to last month, while crude oil imports increased over 7% month-on-month in March to 39.17 million tons, equivalent to 9.22 million barrels per day, which is the second highest on record only after the 9.57 million barrels per day set in January this year. As a result of the plunge in exports and stable imports, the world’s second largest economy recorded a trade deficit of $4.98 billion in March, the first deficit since February 2017, compared to a $27.5 billion surplus expected by the market and $33.75 billion surplus in February, shows the data released by China’s state customs on Friday. Measured in the yuan, China had a trade deficit of 29.78 billion yuan in March, compared to 224.8 billion yuan in surplus a month earlier, also the first deficit in over a year. 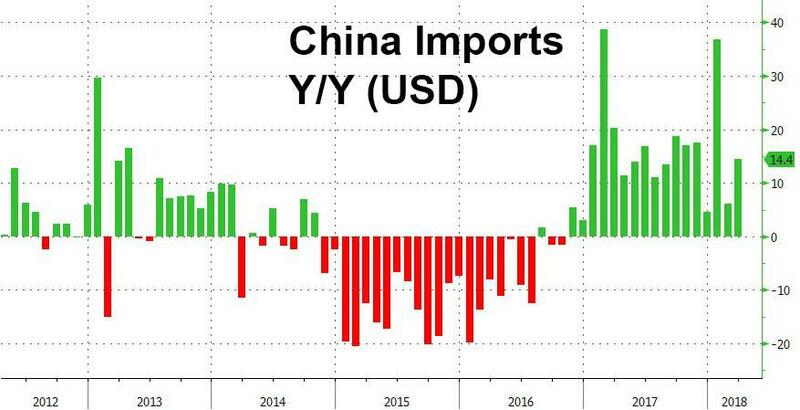 So does the trade deficit and/or plunge in exports reflect either the start of the trade war between the US and China, or perhaps the recent surge in the Yuan amid the sliding dollar? 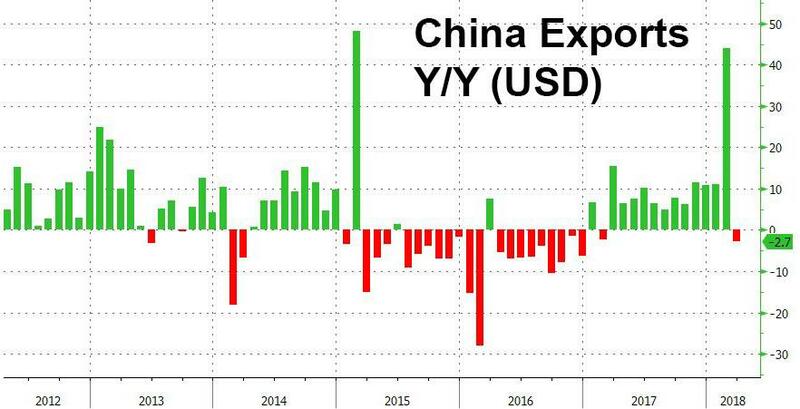 The answer, for now, is neither as the drop in exports was merely a calendar glitch, reflecting the impact of the late timing of the Chinese New Year on exports activity in March. 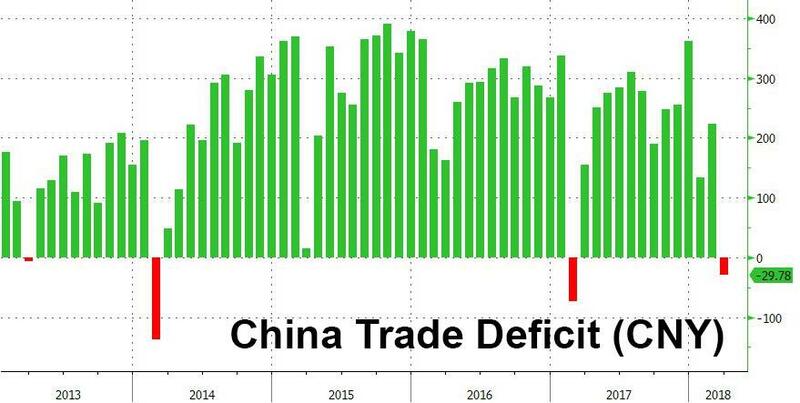 As Bloomberg's China economist Tom Orlik explains, the contraction in China’s exports in March reflected seasonal effects and payback for February’s outsize growth, not the impact of simmering trade tensions. Specifically, looking at exports for 1Q as a whole, the pace of increase remains robust, with strong global demand the main factor according to the Bloomberg economist, with tweeted tariff threats are still some way from real- world policy impact. And while in the context of trade war chatter, a decline in exports looks alarming, there’s a simple explanation. March’s 2.7% year-on-year drop was payback for February’s 44.1% surge, not a protectionism-induced stop in overseas sales. Indeed, if one looks through the distortions around the Lunar New Year holiday, exports in 1Q notched a very robust 14.1% growth rate. Goldman agrees, and in a note overnight, points out that "the significant fall in year-on-year exports growth was primarily due to the late timing of Chinese New Year this year (February 15), as export activities didn't fully resume for some weeks after the Chinese New Year holiday, while March 2017 exports were not affected much since the festival was in late January." Indeed, unlike exports, imports have been less volatile as a result of seasonal effects. An expansion of 14.4% year on year in March, up from 6.1% in February, showed domestic demand remained robust. A growth rate of 18.9% for the first three months of the year was also remarkably strong, and confirms other activity indicators pointing to a resilient reading for 1Q GDP. What is key, however, is that both US and Chinese threats of additional tariffs on U.S. autos, aircraft, and soybeans, and promises of further opening to friendly trade partners remain proposals rather than policy, with no impact on the data. Commenting on the trade deficit, Huang Songping, spokesman of the state customs said that "China has never take trade surplus as a goal. China’s trade surplus with the US is due to difference in industrial structures and competitiveness between two countries as well as international division of labor." "Our trade surplus with the US is not as big as people think if taking into account of transit trade and service trade," added Huang, adding that China’s imports and exports are expected to face some challenges in days ahead, and said that while China’s trade with its major trading partners still growing steadily, its imports and exports with countries covered in the One Belt One Road initiative is growing even stronger. Looking ahead, the two key variables will be the strength of global demand and the dynamics on protectionism and opening. On the former, a bigger risk is there are some clear signs that demand is coming off the boil. A weighted average of PMI readings for China’s major trade partners has come down for the last three months, while China's credit impulse has tumbled to multi-year lows. On the latter, recent signals suggest that a full-blown trade war will be avoided, although the situation changes daily, just as fast as the market's mood.